The GLOBE Board of Directors is currently seeking additional candidates with expertise in various areas for board membership and board-level committees. Candidates are expected to serve 6 months on a board committee before being considered for a board position. For more information on opportunities on board committees, please visit the "Get Involved" webpage or click here. All interested individuals should complete this brief questionnaire and we will follow up with you. The GLOBE Academy Board of Directors is the governing body of the School and is responsible for overseeing the effective, faithful execution of the mission through the school’s program and operations. The Governing Board holds monthly formal meetings. The meetings are announced in advance, posted on the school calendar, and open to the public. Agendas, minutes, and committee notes along with school financials and other board-level documents can be found on the school website. Each board meeting has an open comment period and we invite you to voice your comments in this forum. The committees of the GLOBE Academy Governing Board level meet at least monthly. Each of these committees are chaired by a member of the Governing Board and comprised of members of the Board, Administration, and selected staff and parents. Language immersion, constructivism, workshop model and responsive classroom approaches work together to create GLOBE’s unique learning environment. This committee is charged with defining our education standards in line with our charter promises, devising measures to monitor goals, establishing strategies and plans to build our three language tracks, and developing plans to grow, retain, and hire exemplary teachers. This committee leads the planning for GLOBE’s charter renewal. GLOBE, like every charter school, operates under a charter. The Charter approval is valid for 5 years. In year 4 of 5, all charter schools must submit for charter renewal. This process includes demonstrating that the school has met or is moving towards meetings its proposed goals as laid out in the charter. 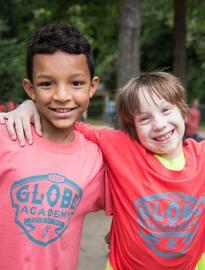 Did you know that GLOBE is an acronym and stands for Global Learning Opportunities through Balanced Education? It's more than just the word “Globe”. GLOBE is who we are and this committee works to make sure that our brand and our vision is clearly communicated amongst stakeholders and outside our community. This committee also oversees GLOBE’s website and social media platforms, helps to increase stakeholder awareness, and garners stakeholder feedback through information sessions and key surveys throughout the year. Development Committee - Goal: To raise funds to meet GLOBE’s budgetary needs. This committee oversees GLOBE’s largest fundraisers, including the Annual Fund, to meet the budgetary needs of our school. The Development Committee also leads GLOBE’s efforts on securing grants and will be responsible for GLOBE’s capital campaign. ﻿This committee is responsible for the following objectives: ensuring that the diversity of our student body meets or exceeds the diversity from the population from which our students are drawn; establishing an ongoing diversity-related goal which includes training for faculty, staff and the Board; creating goals to mentor, promote and retain a diverse faculty, staff and Board of Directors; and facilitating other diversity-related initiatives in conjunction with the Head of School, Board of Directors and other relevant stakeholders. The committee oversees implementation of facility renovations and maintenance. Having been in place since GLOBE’s inaugural year, the committee has provided guidance on building improvements, real estate procurement, lease agreements, expansion planning and design and construction. Committee is responsible for board member recruitment, nomination, orientation, training, and evaluation of Board members in accordance with the bylaws and policies and practices approved by the Board. This committee also reviews and recommends changes to bylaws and board policies as needed. ﻿The committee is responsible for designing and developing, in conjunction with the Head of School, a year-round process for the Board to continually strengthen its partnership with the HOS, establish clear annual goals, structure a process for the Board to provide feedback throughout the year and to complete a formal annual evaluation of the HOS's performance. The strategic planning committee is responsible for creating, reviewing, and proposing changes to the school’s long-term strategic plan. The committee includes the Head of School, other board members, select teachers, and chair(s) of the Parent Teacher Community Council (PTCC) and or the PTCC’s Foundation.